Corporate Coaches' Andy Bardar with Florida Dolphin Tours' Andy James (left to right). Fort Lauderdale, Fla.-based Corporate Coaches purchased the transportation division of Orlando’s Florida Dolphin Tours. Corporate Coaches was founded in 1998 and has grown into one of Florida's largest and most diverse bus operators, with a range of vehicles from limousines to mini-coaches to double-deck motorcoaches providing charter, casino and limousine services. 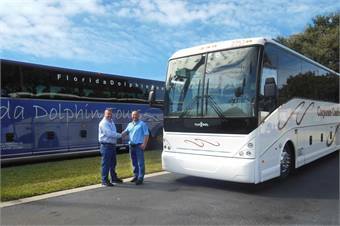 The acquisition of Florida Dolphin’s coaches increases their total fleet size to 70, including 38 Van Hool motorcoaches. Florida Dolphin Tours, founded in 1996, started by providing scuba diving tours all around Florida. Having successfully transitioned from scuba tours to becoming a full-service excursion and sightseeing company, it currently has 45 different offerings, ranging from swimming with Dolphins and manatees to daily excursions to Kennedy Space Center Visitor Complex and sporting events.